Hey everyone, I’ve decided to move my blog! I can now be found on cupcakesandeyelashes.com, so please update your bookmarks and follow me there instead! Tuesday was my birthday (and also my birthday twin Anna Wintour’s, so happy belated birthday to her as well), but because the Captain and I were both so busy we decided to celebrate today instead. Something that we’ve both been wanting to do is go to Bounce, which is an indoor trampoline park, and this seemed like a perfect opportunity to go. I haven’t been trampolining since I was about fourteen and managed to trigger a dormant bout of food poisoning by jumping on a trampoline in a friend’s backyard, so I wasn’t sure how good I was going to be at it. It was super fun though! We got an instructor to show us some (very basic!) tricks and we immediately decided that we’re going back next week as well. We got super sweaty and gross as well, so it’s obviously a pretty good workout. This form of cardio is way more fun than jogging, just saying. I really hope there’s something like this in London as well! After that we went back to Smith and Daughters because we knew we’d be able to get a kickass birthday dinner there, and they didn’t disappoint. I even got a pin of their awesome neon “eat vegan” upside down cross! All in all this birthday gets 10/10, would definitely do it all again. Today is World Vegan Day! Merry vegan Christmas to all my fellow plant munchers. I celebrated by going to the vegan fair in the Melbourne show grounds – I nearly gave up so many times on the way, but I persevered! I was going to go by bike, but I realised it was a lot further than it looked on the map, so I gave up and was going to go to Starbucks and play with my phone instead. I have a tendency to just do the same thing all the time that I’m really trying to break, so I was pretty disappointed in myself. I am trying to work on not being so negative about new experiences! So I decided it was a great opportunity to do something new, even if it did turn out to just be ok. So I hopped on the tram instead and made my way to the show grounds after all! All in all I think it took me about an hour and a half, so when I walked in I was definitely hoping for something amazing to make it worth my while. My friend who had been there earlier in the day said that it was pretty poppin’, so judge my surprise when I walked in and there was just one guy talking about animal rights to a crowd of about fifteen people, some Falun Gong practitioners, and three non food related booths. My disappointment was tangible. I did the quickest rounds around the room ever, and was just going to go back to the city – I was telling myself to be proud that I didn’t flake out, at least. Luckily, on my way out I heard some music, and I thought I’d go and explore where it was coming from, and it turned out that all the fun stuff was actually in a different part of the show grounds. There were all the food booths I’d been wondering where the hell they were! I strolled around for a bit and just basked in the atmosphere – I’ve never been that close to that many vegan cakes at the same time. It’s a pretty beautiful experience. I don’t know how much I actually enjoyed it – it was nice to get me some of that cake, and being able to buy some things that aren’t widely available (I got some vegan meringues!) but there wasn’t that much more to it, I thought. I might just put it on the list of things I’m glad that I tried and leave it in the past! I have been simultaneously sick and PMSing for two whole weeks now, and basically unable to do anything more interesting than the very basics. I may have exacerbated my illness by my insistence that going into the city for some window shopping and Starbucks (via bike, no less) counts as part of the basics, but I just get so bored if I stay in for more than a day. I still wasn’t fully well yesterday, but the Captain and I had tickets to a show, so out we went. We started our night off with some hot pot, which I hadn’t tried before. The food was perfectly fine but my tongue is still burnt so I’m thinking it won’t be my new favourite thing. But it’s always fun to try something new! After that, we made our way to the Spiegeltent in Alexandra gardens, to see this cabaret/circus show that was part of the Melbourne Festival. It was definitely one of the better shows I’ve ever seen, with some pretty diverse performances! I always love fire shows and contortion, and there was some super cool hand balancing as well. Totally worth getting out of bed for, even with a blocked nose! Yesterday was apparently national coming out day, which I completely missed until the Captain came out to me as we were getting ready for bed. It’s a day worthy of celebration, of course, so happy belated coming out day, everyone! Love, your friendly neighbourhood bisexual. Today is just a normal day, as far as I’m aware, but I thought I’d make myself a bit pretty. I never use my white eyeliner for anything except dots all over my eyes, but when I saw this video I realised that contrary to what I previously believed, you can make a white cat eye work. So I recreated it! 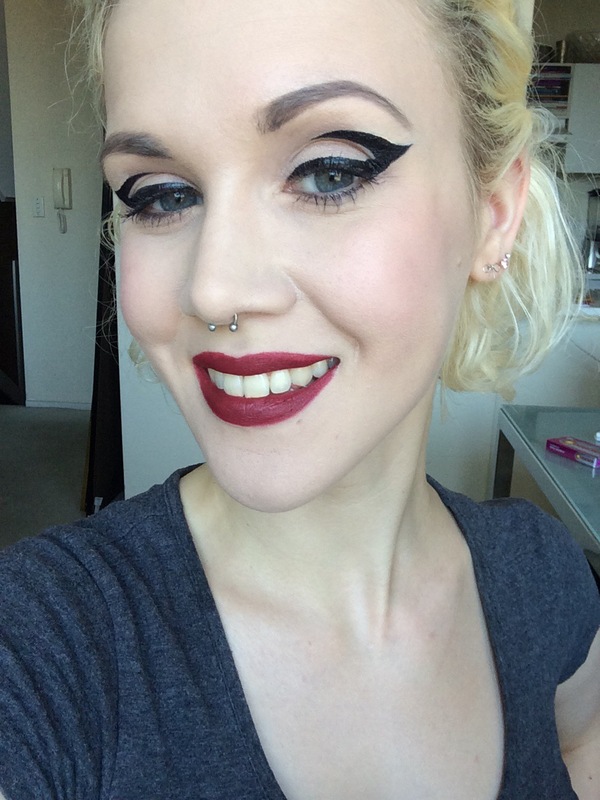 I used Illamasqua’s liquid liners in Scribe and Abyss – a white liquid liner seems a bit weird at first, but I’ve honestly used it a lot more than I thought I would when I first got it. Would recommend! Oh and hey my hair is grey! I had to get my roots done, and I hadn’t actually planned on changing it up, but while I was there I caught myself thinking I should get some grey toner on the way home, so I let my hairdresser do it instead. It was terrifying to once again venture out into the straight world (hah!) but I survived, and I managed to find a girl who would at least listen to me when I asked her for some layers. For the past two years or so, I have not owned a pair of jeans. The only thing I’ve worn is basically skirts or yoga pants (or, to my younger self’s horror, trackies). It hasn’t exactly been a huge problem, but more and more I have felt like I need some jeans – it’s not so bad when I just go someplace else to escape winter, but I don’t think that’s a viable strategy to follow for the rest of my life. So I finally got me a pair! It wasn’t that easy to find a pair that fit all my requirements, because I need a higher waist than most stores seem to think I do, and I am very particular when it comes to colour. The above or one shade darker are the only acceptable options. In the end I found these in H&M, which is pretty typical, I suppose. You can take the girl out of Sweden, but you can’t take her love of cheap fast fashion. I just hope they’ll last! Today I’ve experimented with some graphic eyeliner! I have been a bit reluctant to do it previously because I keep assuming I do not have a steady hand. I don’t know why, because I’ve perfected the art of the winged liner, but it’s one of those things that I’ve carried with me for years – I did not have a very steady hand when I was younger, so despite evidence that I have improved, I have gone through life thinking that I am the sort of person who just can’t do certain things, like draw a straight line. And those are the kinds of assumptions we should always be challenging about ourselves! This is perhaps not the most elaborate graphic liner ever, but I am pretty happy with myself for making a first attempt! Evolving and trying new things is always good, even if it is something small. Me and my graphic eyeliner went to H&M to find a pair of jeans – part of me feels really silly for going halfway across the world and still going to the same stores, but what can you do when they’re the only ones who carry jeans that are high waisted enough for me!? Then we met up with the Captain and went for some Vietnamese food on Brunswick street. It was okay, but I don’t think Vietnamese will ever be a favourite of mine. I do like rice paper rolls, but I just can’t stand noodle soup, and that seems to be most of what there is to vietnamese food. Maybe one day I’ll be proven wrong! I am so angry right now! Yesterday, I went out for a bit, and I caught a taxi home, and my driver essentially stole money from me. I know, right!? He asked me to prepay for my journey, which was pretty weird considering going from the CBD to St Kilda isn’t that far, but whatever. I gave him what I thought was a $20 note, but he showed me a fiver and told me that’s what I’d given him. Being the kind, trusting soul I am, I believed him, and I even paid him an additional $10 upon arrival to “make up the difference” – and when I then couldn’t find my $20 I realised he had made me pay pretty much double what I should have! Part of me feels like if he needs $15 that badly he can have it, and I hope he feels really pathetic for it, but a larger part of me wants revenge – I am a pretty vengeful person in general, but I am doing my best to channel it into more appropriate channels. I also feel that because he already had decoy money prepared, this is probably something that he does a lot to people going home late at night, and if people don’t complain about him he will just keep getting away with it. So if you want to be generous you could say that I am saving other people from having a similar experience! I only got an answer phone when I called the company, but I am prepared to call them up every single day until I get an answer about what they are doing about it. There is no end to my well of resentment, and I have all the time in the world to make him regret ever meeting me.